With my travel and general life-hecticness, i don't like to have things that must be eaten in a timely manner, which means most breads and muffins and baked goods are out. I really want to try a baked oatmeal recipe, but didn't have the time for all that. The solution? 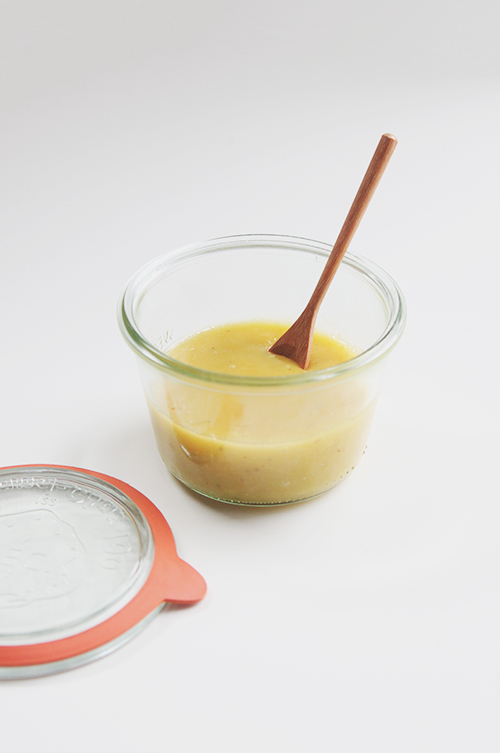 Banana curd. I first heard about this on the Fauxmartha, a great food/home blog. She adapted her recipe from this food.com one- I have to say, her pictures are WAY better, but I actually followed their direction to use the entire egg, not just the yolk. I subbed in coconut oil for butter and coconut sugar for regular sugar, because health. It's an easy mess: I melted 2 T coconut oil and 1/4 cup of coconut sugar in a saucepan, add the grated peel of one lemon and the juice of that lemon. and 5 mashed bananas. I let that cook down for 45 minutes or so, and it barely needed a stir- I even took a shower in the middle. Towards the end, snag out about 1/4 cup of the hot banana mixture and whisk it into 3 pre-whisked eggs to temper- we don't want the egg to cook. Then just dump the egg mixture into the banana saucepan, stir it for a few minutes, and transfer to your pyrex. The apartment smelled HEAVENLY, like bananas foster. I tried it with a spoonful of the Trader Joe's cookie butter with cocoa swirl...and I died. I'm going to try out JUST bananas and lemon, and see how much flavor and texture the egg, oil, and sugar add, but this version was just delicious. Fauxmartha says it should be good for 3 weeks. I'm sure I'll mostly use this on top of oatmeal, but I'm dreaming of a deconstructed banana split too, if I want to indulge. My version has 1,200 calories and 38g of fat in total, but I have a full quart container (4 cups worth). At quarter cup servings, you're looking at 75 calories and 2 measly grams of fat. Sounds good to me.